Additional Information : The Toadstool Mushroom Leather Coral is referred to as Sarcophyton Coral, Mushroom, Leather, or Trough Corals. They are found in various shades of brown, tan or green, with white or gold polyps. It is difficult to identify many species because they all have the similar appearance of a mushroom or toadstool, each with a distinct stalk and capitulum (cap). As they grow older, they develop a folded appearance. The more plain Sarcophyton Leather Corals from Idonesia are easy to maintain in the reef aquarium and make an excellent coral for the beginning through expert reef aquarist. The colored Sarcophyton Leather Corals from Tonga are much more difficult to ship and maintain, and are only for expert aquarists. Toadstool Mushroom Leather Corals require medium to high lighting combined with medium to strong water movement. For continued good health, they will also require the addition of iodine, strontium, and other trace elements to the water. Propagation Information : Propagation by the experienced hobbyist is often accomplished by cutting off a portion of the Coral's crown and attaching that piece to live rock or placing it in the sandy bottom of the reef aquarium. 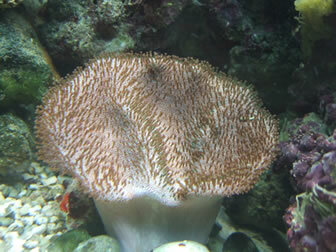 Toxicity Information : These corals are toxic and can harm other tank inhabitants.